Where Benedict was worried about cracking up on day 11, our friendly dithering dodo, Darwin, on day 10 isn’t really sure what to do; ever! Likes: As you can see, they are partial to a beany hat with a lovely bobble on, and also like beak polish – see how shiny they are? 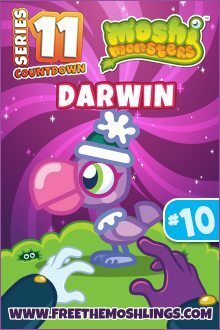 Isn’t Darwin cute? Come back for day 9 tomorrow as we approach the half-way point in our countdown…can they beat him for cuteness?